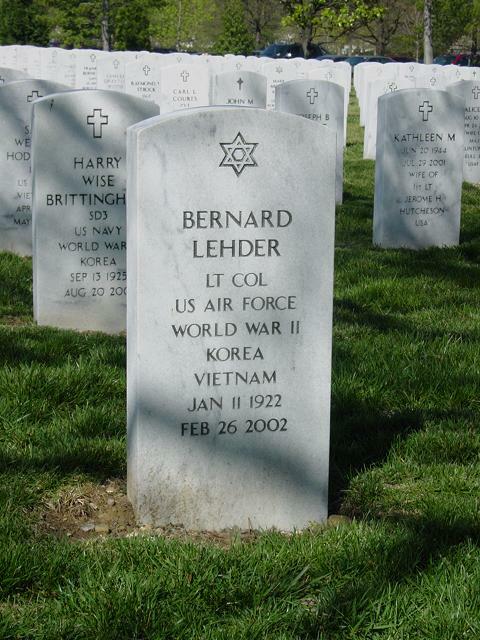 CHESAPEAKE, MARYLAND - Bernard Lehder, Lieutenant Colonel, United States Air Force (retired) died, February 26, 2002 in his home. Colonel Lehder, a native of Brooklyn, New York. He was a retired Lieutenant Colonel in the U.S. Air Force with service in World War II, Korean Conflict and Vietnam. He also retired as Director of Human Resources at Johns Hopkins Medical School in Baltimore, Maryland. Survivors include his wife, Blanche Lehder; a daughter, Marty Lehder Jackson and husband Charles A. of Isle of Palms, South Carolina; three step-daughters, Charlene Knowles of Chesapeake, Virginia Walters of Manassas, Va., Sharon Williams of Palatka, Florida; a step-son, Robert Moore of Charlotte, North Carolina; grandchildren including Wiley H. Jackson. A memorial service will be held at 11 a.m., Friday, in Foster Funeral Home, Portsmouth by Rabbi Arthur Z. Steinberg. Entombment will be at a later date in Arlington National Cemetery. In lieu of flowers, memorial donations may be made to Johns Hopkins Medical School in Baltimore, Maryland, or the Chesapeake, Virginia Fire and Rescue Department.